It's bedtime, and all we've achieved today is moving every item we have on the boat from its rightful position to one that's as far removed from where it should be as we can get it without actually leaving the boat. The stuff from the aft cabin had to move to the forward cabin because there's work to be done there over winter, and the stuff from the forward cabin had to move to the main cabin because there's work to be done there over winter, and the stuff from the two bathrooms (ok heads if you want to be picky) has to be removed because the blokes need access to all the pumps and things, and the stuff from the main cabin had to move somewhere as well because we need to keep all the access to the bilge areas free and open. We did work out that we can get two bikes upside down and without their wheels on, on the bench straddling the stove, so that's a start, and by crawling along the bilge I got to a space under the helm where there was enough room to store the wheels out of the way of the fibreglass work to be done. 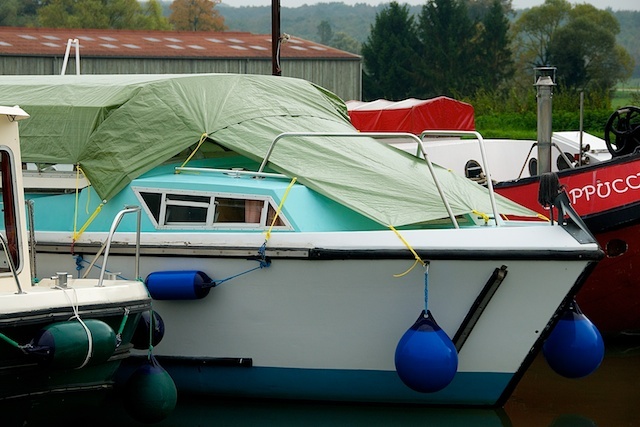 The wrapping job looks neat though, it's such a pity that it will probably all have to come off so the blokes can move the boat, and sure as eggs they won't remember how to put it back, but at least it will keep some of the melting snow out of the bedding we hope. And Mr P? Well it's the water pump I'm afraid, and while we are arranging a substantial increase in our investment in the boat, with new electrics, upholstery and a bit more remedial work on the hull, it's a bit of a rude stunt to pull if I do say so myself, and Old Smokey isn't going to get out of chugging us along just yet! But not to worry for now, tomorrow we have a train to catch and a new adventure awaits. So sad to see it wrapped. I have been enjoying your adventures. Though I am sure you will find adventure elsewhere to keep me amused.